Born in Plymouth Adrienne Hill trained to become an actress at the Bristol Old Vic. After spending 8 years in repertory theatre she auditioned to play the part of Princess Joanna in the 1965 Doctor Who story "The Crusade" which she was unable to secure. However, she was remembered when the part of Katarina in "The Myth Makers" was cast. In the late sixties various television work followed including a regular role in the radio play Waggoner's Walk. After spending time abroad she returned to the UK in the late seventies and became a drama teacher. Katarina was a Trojan handmaiden who lived through the events surrounding the siege of Troy by the Greeks. She finds herself, like many of The Doctor's companions, on board the TARDIS completely by accident. However, unlike the other companions Katarina was the most who was entirely unprepared for her time in the TARDIS. When the TARDIS lands outside the besieged city of Troy, and Vicki decides to leave the TARDIS to start a new life using the name Cressida, the Trojan Prophetess Cassandra, fearing that Cressida is a Greek spy, sends her young handmaiden Katarina to spy on her. It is when Steven becomes badly wounded by a sword that Katarina is ordered by Cressida to help The Doctor get Steven back to the TARDIS. When inside The Doctor dematerialises the TARDIS- Vicki having decided to stay behind after falling in love with the Trojan warrior Troilus-, only realising to late that Katarina is still on board due to the distraction caused by Odysseus’s attempts to claim the ship ("The Myth Makers"). Katarina's background as a slave meant that she was very loyal to her new ‘master’ and keeper, and she carried out his instructions as best as she could in this new and strange world that she found herself in. She was very much in awe of The Doctor, referring him to as 'Lord' and her relative simplicity meant that she saw the TARDIS as his temple. Katarina took everything in her stride and felt that she was on a divine journey to 'her place of perfection'. Katarina truly believed that she was on a journey that was pre-destined for her and that it would ultimately lead to her death. But this did not distress her at all. In fact it enabled her, with the help of her non-aggressive nature, to accept to a certain degree all the wonders and miracles she found herself involved with. Even though she found herself moving further and further away from the world she was familiar with as the TARDIS took her to futuristic worlds and locations- including a dying industrialised world that had been reshaped by living machines centuries ago ("Scribbles in the Chalk"), although the need to treat Steven’s injuries prevented The Doctor taking action at this time-, she understood that The Doctor was essentially a good person. Despite being very much dependent on The Doctor, and occasionally too trusting, such as when she automatically assumed that new arrival Bret Vyon had been sent by The Doctor to help Steven when in reality he had stolen the TARDIS key, Katarina was far from stupid, as demonstrated when she swiftly saw through Vyon’s lie. She was all too aware of what was going on around her, simply translating it into terms that she could understand, such as referring to the Daleks as the ‘evil ones’. She was also more than capable of acting to right a wrong, even though this would ultimately be at the expense of her own life. However, as had prophesied by Cassandra, her life was to be very short lived and this became true when in the very next story after she joined her time aboard the TARDIS came to a very abrupt and premature end. While fleeing from the Daleks she is taken hostage in the airlock of a spaceship by an escaped convict who threatens The Doctor with her death if he does not take him to the Daleks. Knowing the predicament The Doctor is in and how important it is for him to reach Earth and defeat the Daleks she manages to open the outer door and is ejected, along with the convict into the vacuum of space ("The Daleks' Master Plan"). 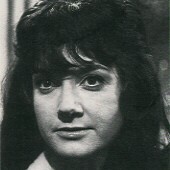 Katarina became the first companion to be killed and of the human companions she spent the least amount of time with The Doctor appearing in only 5 episodes. The aftermath of her death was briefly seen in the short story "Katarina in the Underworld", where Katarina was aided in her attempt to appeal to the Greek god Hades to enter the Elysian Fields by The Doctor- who apparently entered the Underworld in a dream, although he may equally have been nothing more than a ‘dream’ of Katarina’s imagination-, who argued that the nobility of Katarina’s sacrifice to save those who would have been doomed by the Daleks should guarantee her a place in Paradise. As The Doctor vanished, Katarina entered Elysia, grateful that, whether The Doctor who had been present was the real Doctor or only her ‘memory’ of him, he had given her the strength to fulfil her destiny and save lives. Despite the brevity of his time with Katarina, The Doctor continues to remember her all the way into his eighth incarnation, with such diverse enemies as the Quantum Archangel ("The Quantum Archangel"), the Timewyrm ("Timewyrm: Revelation"), the Kro’Ka ("The Last") and Faction Paradox ("The Ancestor Cell") attempting to use The Doctor’s guilt over Katarina’s death to put him emotionally off-balance and force him to do their bidding, always regretting that he was unable to save her. On discovering that the Daleks are on the planet Kembel The Doctor steals the Taranium Core, that is needed to fuel the Time Destructor, thus disrupting the Daleks' plans. The Doctor, his companions and Bret Vyon are pursued, in Mavic Chen's Spar ship, by the Daleks. Before reaching Earth they are forced to land on a prison planet called Desperus where a convict named Kirksen manages to get on board just before they take off again. Suddenly Katarina finds herself held hostage in the ship's airlock. Realising that her predicament will prevent The Doctor from escaping from the Daleks, she opens the outer door and they are both ejected to their deaths in space ("The Daleks' Master Plan").